Comic-Con Wrap-Up & TV Fights! 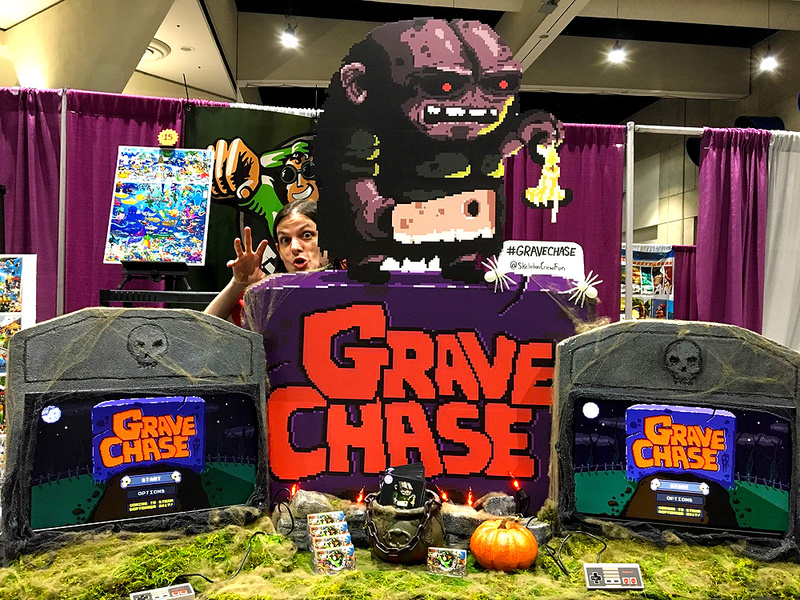 Yep, we turned our booth into an actual graveyard to promote our upcoming Steam game, Grave Chase! Full credit goes to Re for this killer booth design. She really pulled off something special, and it drew people in like crazy. I wasn't sure if we needed the game running on two separate systems, but we had such a constant flow of visitors, I was relieved we had 'em. From putting the monitors inside the tombstones and flickering orange lights, to having real moss on the table and cobwebs everywhere to give attendees an extra level of escapism while playing the game, I simply loved everything about the booth this year. So again, a huge thanks to Re for taking the time to design it so nicely, and a huge thanks to all of you who stopped by to say hi, test out the game, and pick up a pixel poster. 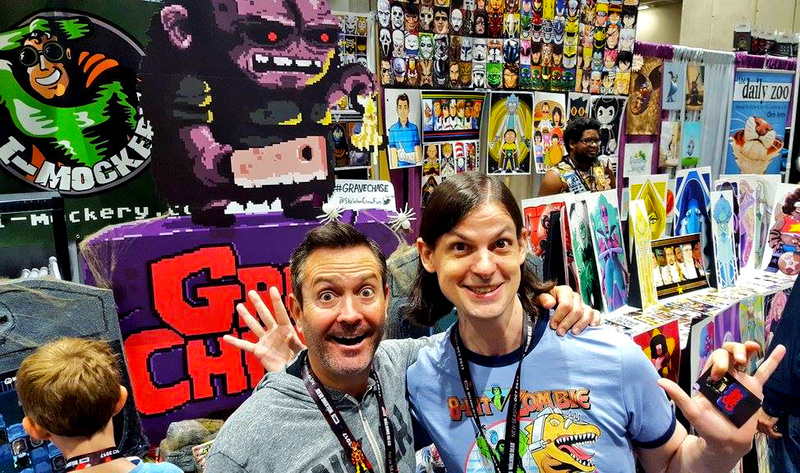 Seeing friends and fans, both new and old, is always one of the biggest highlights of Comic-Con for me. The work I do is quite solitary, so it's always a huge pick-me-up to meet everybody there. Even Thomas Lennon (Reno 911) stopped by to let his kids play the game! The reception to Grave Chase was absolutely wonderful, and seeing how excited and panicked it was making everyone has me counting down the minutes to its release on September 20th. Can't wait for all of you to finally play it! In other news, I was on the most recent episode of Screen Junkies TV Fights! Many of you have seen me on Movie Fights episodes over the years, but I've also appeared on a bunch of TV Fights episodes as well. Only thing is, until now, they were always behind the Screen Junkies Plus service paywall. Well, this latest episode marks their first official switch to YouTube where everybody can watch TV Fights for free. It's a really fun episode, and I finally even got to talk about my favorite old Outpost commercials, so give it a watch. That's all for now, but remember... this site comes aliiiiiiiive on September 1st for our big annual "Two Months of Halloween" celebration! So start carving your jack-o-lanterns now, because things are gonna get spooooooky around here. Sounds like an absolute blast. I didn't even know TV fights existed. I appreciate you not getting our hopes up each time you appeared there, over something we'd have to pay for to see anyway. oh man oh man oh man, that halloweenish feeling is welling up. I can already feel it and it's barely august. That feeling of "There hasn't been any special candy since Easter, I could really go for a bunch of pumpkin-flavored stuff"
My garden is freaking full of huge orange kabocha pumpkins right now so that doesn't hurt the feeling. Those sweet mothers are going inside SO many thai curries I tell you what. Halloween, the most wonderful time of the year. You were on again? Awesome. I haven't watched TV fights in a few months. I'll have to check it out. I've visited this place for the past several weeks now, reading old articles and getting a virtual cooling as a little respite from the absolutely post-apocalyptic, scorched wasteland that is boiling me alive this summer. So reading this post about some approaching 'fall event' seems very surreal now, like the possibility of not being on fire or melting in 100+ degrees is a distant memory. I swear I think I saw lord Humungus and the gang drive by me a few days ago. But I'm glad you've had a great promotion of your game, it does seem very cool and I can't wait to play it, and to celebrate the fall holiday on this site as usual. ColdFusion - Yeah, I never posted the TV Fights stuff on here in the past since it was behind a paywall, but I always plugged it on my Twitter for anyone who did have a subscription. Glad that's no longer needed. Hopefully they'll upload the archived episodes sometime so everyone can watch them.... cuz we had some really great debates. My debate regarding Martha Stewart's buns is one of my favorite Screen Junkies memories. Also, glad to hear your garden is keeping your Halloween spirits high while we wait for the season to begin on September 1st! Matt32 - You are correct, sir! Tadao - Yep. I love debating on that show, and I'm really happy anybody can watch it now without having to pay the subscription fee. Thanks for watching! Conan - Makes me happy to hear this site serves as a cooling respite from the brutal summer heat. May Lord Humungus spare you from a post-apocalyptic doom, so that you may enjoy the coming Two Months of Halloween with a comforting chill in the air! I don't know if you ever saw the thread, but a while back I put all your Movie Fights in a thread. Looks like I have to update it. Tadao - Don't think I saw that, but thanks! Certainly helps to have 'em all in the same place so I don't have to track 'em down one by one. I'm just happy not to have (as much of) the usual summer candy drought, J. Among other things they've really stepped up the 4th of July candy. America Skittles are daamn tasty. Previous post: I-Mockery At The 2017 San Diego Comic-Con July 19th - 23rd! Come See Us At Booth #E10! New Game & Poster! Next post: Dust Off Your Bones! I-Mockery’s 2017 Halloween Season Has Begun!